Wavebar® product is a high-performance, flexible mass-loaded vinyl noise barrier, offering superior acoustic transmission loss. It has been designed to meet market requirements for reducing noise in the domestic building and commercial, industrial, transport and marine markets, globally. Pyrotek’s engineering team developed Wavebar to be dense, thin, highly-flexible, tear-resistant and strong, achieving high-performance and high transmission loss throughout the various weight ranges. Australian made, tested by Canterbury University, Wavebar enjoys an unparalleled 40+ year’s reputation in providing effective, industry leading performance in controlling noise. Thanks to the dense core mass layer which reflects and absorbs the transmission of sound through walls, ceilings and floors, Wavebar reduces the critical frequencies generated from mechanical equipment, engine noise and electronic audio technologies such as radio, TV or music and audio. Wavebar also successfully reduces noise transfer in walls, ceilings and addresses interoffice noise transmission, providing comfort, privacy and confidentiality. It can also control the level of crosstalk between acoustically sensitive rooms, control any external noise interference from aircraft, traffic, rain and can be retrofitted over existing walls to increase performance. It is often difficult to create a noise-tight seal, due to the amount of obstructions inside a building - pipes, ducting, light fittings, power points etc. however Wavebar® is simple to cut and install - providing flexibility when installing in challenging places. Within the Wavebar range, products are applicable for both indoor and outdoor areas, especially through the use of acoustic curtains, reducing the transfer of noise from industrial equipment and construction sites. 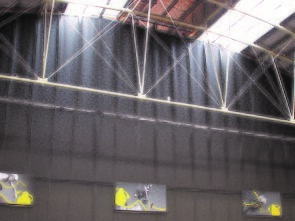 An industrial noise solution is as simple as applying a Wavebar® NC (noise curtain), providing a soft enclosure with a reduction of environmental noise. From an environmental perspective Wavebar meets the highest standards, containing no ozone-depleting substances, in full compliance with European and Australian standards for Volatile Organic Compound (VOC) emissions. Wavebar is free from lead, odour-producing oils and bitumen, resistant to most chemicals, solvents and petrol, and is resistant to weather and UV light.